This sauce is good poured over cakes, pancakes, ice cream, a banana split, baked apples... or just licked straight from the spoon. Add a dash of bourbon for a boozy kick or a few squares of dark chocolate for extra richness. 1. Put the brown sugar, syrup, cream and butter in a small pan and set over a low heat. Melt the butter and dissolve the brown sugar, then bring to the boil, remove from the heat and keep warm. 2. 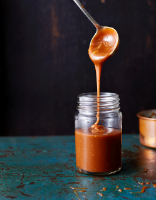 Tip the caster sugar into a medium saucepan (not small, as the caramel will bubble up quite furiously as it cooks) with 2 tbsp water. Set over a low-medium heat and, without stirring, swirl the pan to dissolve the sugar. If any sugar crystals form on the side of the pan, brush with a clean pastry brush dipped in water. 3. Once all the sugar has dissolved, bring the syrup to the boil and continue to cook steadily and without stirring until it becomes a rich amber colour – about 5-7 minutes. Take the pan off the heat, then carefully and slowly add the hot cream and sugar mixture. Stir to combine, then return the pan to a low heat and simmer for a further 30 seconds. Stir in the vanilla and salt, then set aside to cool, covering the surface with cling film after 5 minutes (or tip into a large, warm, sterilised jar). Store in the fridge for up to 1 week.